Sightseeing und Aktivitäten sind einfach von der Kabine aus. Vom ersten Moment an auf die private Straße, die in die Kabine zu drehen, durch das Gras mit Ponderosa Pines und den Wald von Lodgepole und Tamaracks verstreut, werden Sie die Ruhe und Stille Sie während Ihres Aufenthaltes erleben fühlen. Die Hütte liegt in einer natürlichen Umgebung von Bäumen nur ein wenig nach oben entfernt vom Ufer des Lago Blaine. Es ist ein "Great Room": Eine Sitzecke mit Couch und Stühlen; einen DVD-Player zum Ansehen von Filmen und einen Radio- / CD-Player; ein Schlafzimmerbereich mit Queensize-Bett, vier Kissen, an der Wand befestigten Leselampen und Nachttischen; eine voll ausgestattete Küche mit Tisch und Stühlen; und natürlich ein eigenes Badezimmer mit Handtüchern, Shampoo und Duschgels; und eine Terrasse mit Tisch und Stühlen sowie Liegestühlen zum Entspannen. Sonnenbaden auf der Anklagebank oder Seeufer. Schwimmen, Schnorcheln, oder zu Fuß die Wanderwege durch den Wald auf dieser 13-Morgen-Eigenschaft, wo Rehe, Füchse, wilde Truthähne, Adler und Eulen sind oft gesehen. Vielleicht möchten Sie einfach nur "Kick-Back" in der Hütte oder verwenden Sie es als Ausgangspunkt für Ihre Montana Urlaub. Der Glacier Park ist nur 30 Autominuten von The Cabin entfernt. 20 Minuten zur malerischen Stadt Bigfork; ca. 40 Minuten zum Whitefish Mountain Resort; und Kalispell, nur 15 Minuten entfernt; und nur 5 Autominuten von The Cabin entfernt ist eine Tankstelle mit Restaurant, Bar und Deli für Kaffee, Sandwiches und Eis; und einen 9-Loch-Golfplatz mit Restaurant. Die Kabine ist für den Winter für Ihr Ferienhaus von Mitte Mai bis Mitte September geschlossen, aber vorhanden. Badezimmer mit eingebautem Waschtisch, WC, Dusche, Wandschrank und Schubladen. Handtücher, Waschlappen, Lotion, Seife, Shampoo, Duschgel, Kleenex und Haartrockner. Bitte fragen Sie Eigentümer über Reinigung und weitere Dienstleistungen können Sie. The cabin was perfect for us. Very clean and well stocked with all the little things we needed to make our stay very enjoyable. Sue, (the owner of the cabin) even left us ice cream and fresh Huckleberries to put over the ice cream. Not to mention the homemade Huckleberry jam she put in the fridge. It was a real treat in the evenings. So relaxing to set in front of the windows and just look out over the lake. As far as things to do..........there were a million things to do and see. We saw deer and fawn each morning that would come down to the lake. Glacier was beautiful. The towns of Bigfork and Whitefish were great. We even went to the Northwestern Montana Fair and Rodeo in Kalispell. I wished we could have stayed and few more days. If you are looking for a wonderful place to stay this cabin is it. Thank you Sue. Amazing week and perfect location away from it all! Had a very nice stay here. We spent most of our days either hiking at Glacier National Park or checking out the nearby towns of Bigfork, Kalispell, and Whitefish. The cabin was perfect for a bit of dawdling in the morning over coffee and cooking breakfast with the lake and mountains as a backdrop. The huckleberry jam and pizzelles were a nice touch! The kitchen was plenty big to cook dinner for two in the evenings. Overall, a peaceful and cozy place to stay only thirty minutes from the park. Wonderful get-away for vacation to Glacier. This is about 30 minutes from Glacier but in hind sight we are so glad we did not stat in Glacier as we most likely would not have left Glacier to explore other places, like Whitefish or Big Fork Staying on Blaine Lake was wonderfully private and Sue was extremely helpful. Her place was very comfortable especially after a long day of hiking and sightseeing. While my husband did did catch fish in Glacier park, he did on Lake Blaine! Only one issue, the shower was a bit difficult to use, but I'm sure that will be resolved quickly! Otherwise, wonderful experience! Thanks for the review and the heads-up on the shower. This little cabin was great. All the equipment was available to make my own meals. The big front windows to view the lake were perfect and the view of the Lake Blaine was great. Floating devices were available to float in the lake. The bed was comfortable and plenty of linens for our stay of 5 days. The cabin was very clean, occasional wood ants, but what do you expect when in the woods? The cabin is 15-20 minutes away from Kalispell or Bigfork for many great places to eat and 5 minutes to a convenience store for forgotten items. Sue was there to open up and get us settled right away. I would certainly recommend this cabin for those wanting to be on the lake as it is a very short walk to the shoreline. Perfect for 2 people, and there is a hide a bed in the couch, just ask if it is ok to have overnighters as the rules say no overnight guests. A must place to go for a great meal and microbrew is Tamarack Brewery in Lakeside, about 30 minutes south on the west side of Flathead Lake. Flathead Lake Brewery in Bigfork is another brewery with good food. Downtown Bigfork is a fun place to wander into little shops and a quaint little town. The old town side of Kalispell is also a great place to wander about and look in lots of little shops. I would definitely stay here again the next time I need a place to stay close to Kalispell. My husband and I stayed for a week in this fantastic cabin and had a great time. 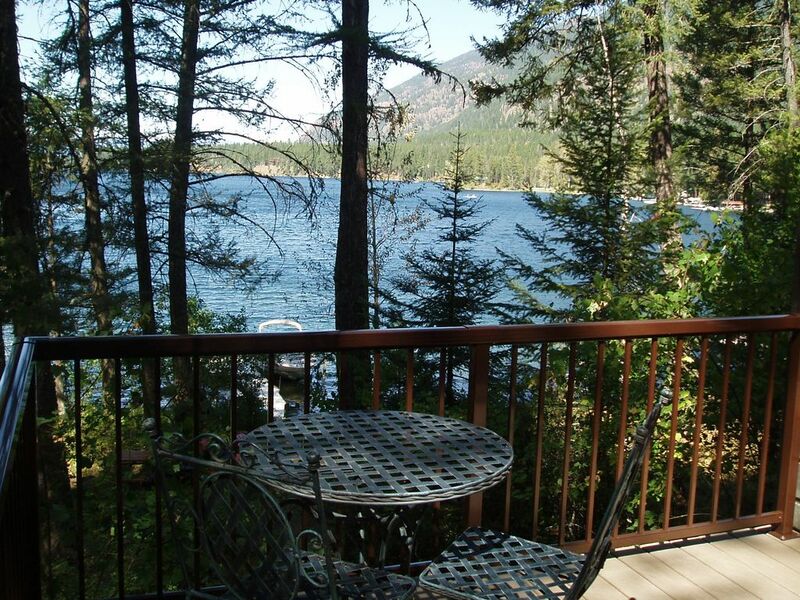 Nice and private, lots of windows, right on the lake, nicely decorated and very comfortable. Sue, the owner, was delightful and very accommodating.